The latticework metal spire that stands behind the St. Vincent de Paul parish center may look a bit like modern sculpture, but that’s not why it’s here. It’s one of the few things that remain of one of Albany’s most extraordinary educational experiments. For decades, the pupils in Vincentian Institute’s grade school met on these grounds to study under roofs of glass, first in converted greenhouses and then in classroom buildings built to maximize their exposure to what administrators believed were the health-giving rays of the sun. Knickerbocker News photo. September 11, 1936. Vincentian Institute began in the building at the corner of Madison and Ontario in September of 1917, with 280 children in kindergarten through fifth grade. Under Father William Charles, third pastor of St. Vincent de Paul parish, VI added a grade per year until the school offered K-12 education, with the first high school class graduating in 1925. Administrators started adding to the school property almost immediately: The neighborhood was growing, and so was the school. 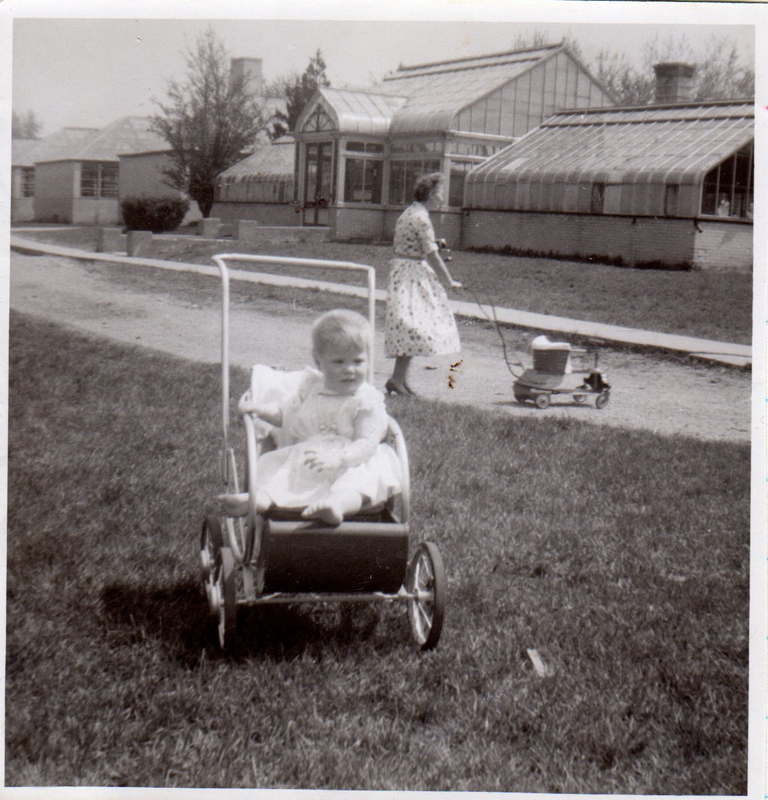 In 1934 the parish bought the Madison Avenue estate of George and Theodora Hawley, whose home, grounds, carriage house and two glass conservatories all became part of Vincentian’s continuing expansion. For those conservatories, Father Charles had something special in mind. He named the endeavor the St. Vincent Child Culture Division, and young students filed through the glass doors to learn under a canopy of sunlight. There is, of course, this question: Why put a school in a greenhouse? Sunlight causes the bones to grow. It develops muscles and brain. It strengthens and invigorates the skin and increases its resistance to infection. It prevents and remedies disease — not merely rickets, tuberculosis, anemia and the like, but all disease. At the end of nine months, the children who had studied under the quartz glass had gained an average of an inch more in height and three and a quarter pounds more in weight than the children under ordinary glass. Knickerbocker News photo, September 1934. He was so pleased with the results, in fact, that St. Vincent CCD added two more steel and glass school buildings by 1936. He also encouraged classes to meet outside in nice weather, so students could learn as “the ancient Greeks did,” in Father Charles’ words. 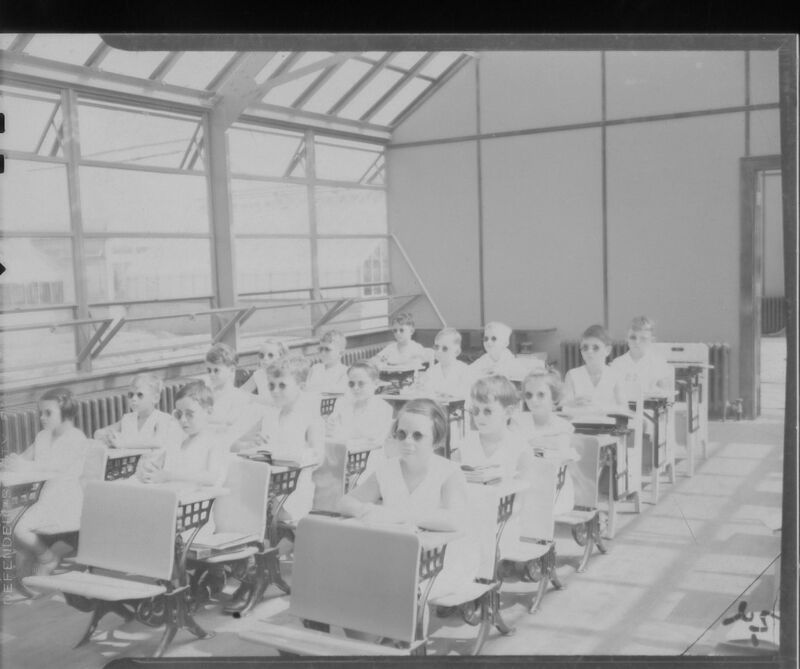 This 1938 Knickerbocker News photograph gives an overview of the glass school project. Did it get warm in the greenhouses? Oh yes, though adjustable roof vents did help regulate the temperature. The children, at least, had those short, sleeveless uniforms. Most of the glass school’s teachers were Sisters of Mercy, teaching in black habits that, according to Vincentian lore, would get bleached out by the sunlight. The love affair with the sun faded after Father Charles’ death in 1944. With enrollment still growing every year – in 1950, there were 1,246 children in the grade school and 1,255 in the high school – administrators reassessed their facilities. They added a one-story, thirteen-classroom building named the Father Charles Memorial School. One of the Hawley greenhouses came down then, and the other glass classrooms, the ones built in the 1930s, got roofs of slate, and parts of their walls were screened with concrete. By the end of the 1960s the grade school was operating at a loss and the parish was short on funds. All the buildings needed renovations, and parish administrators were concerned about the glass classrooms’ poor energy efficiency. What’s more, enrollment was in sharp decline: Families were smaller, and the suburbs were calling. Photograph courtesy of Carol Dwyer. This one was taken in the mid-1950s. Vincentian's high school was the first to succumb to the changes, closing in 1977. St. Vincent CCD shut its doors after the 1984-1985 school year. Today, the Hawley Mansion is the College of Saint Rose’s Huether School of Business. The Father Charles Memorial building is part of the college's Hearst Center. The Hawley carriage house – “The Barn,” as it was known to generations of CCD children – is a Saint Rose theatre. The glass school buildings have been demolished. But the school bell is still there. In old photographs you can see the latticed metal bell tower atop the glass schoolrooms that Father Charles built in the mid-1930s. When those buildings came down in the late 1990s, a small group of CCD parents and alumni made sure the bell tower was set aside. After the new St. Vincent de Paul Parish Center opened in 2001, they poured a concrete base for the bell tower behind the property and erected it as a memorial to a place that for thousands of Albany children and their families was an anchor of neighborhood life. Have memories of the glass school to share? Send them to history (at) uppermadison.org and we'll post them.